It’s important to know the location of a great bakery whether you’re in Boston, New Orleans, or Washington, DC because baked goods are a great hostess gift or a nice touch when hosting an important meeting. My favorite bakery in San Francisco is everyone’s favorite bakery in San Fran because the couple that own TARTINE BAKERY are baking geniuses with tons of awards to prove it. TARTINE’S Scottish Shortbread recipe feeds quite a few people, so its the perfect cookie for the holidays. Butter a 6-by-10 inch glass baking dish. Sift the flour and cornstarch together in a bowl. In a mixing bowl, mix the butter and salt with a wooden spoon or whisk dissolving the salt completely. Add the sugar and mix until combined. Add the flour mixture and mix until a smooth dough forms. Pat the dough evenly into the buttered 6-by-10 inch glass baking dish, no more than 2/3 inch deep. Bake the shortbread until top and bottom are lightly browned, the middle should still be light, about 30 minutes. Cool shortbread slightly on wire rack, but they must still be warm to the touch in order to slice them. While still warm sprinkle with sugar (¼ cup) evenly coating the top. Tap out any excess sugar into a bowl. 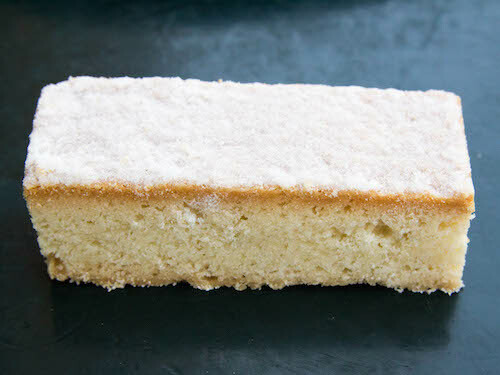 Using a sharp knife, cut the shortbread into rectangles about ½ inch wide and 2 inches long. Let the shortbread cool in the baking dish before removing them with a small offset spatula.